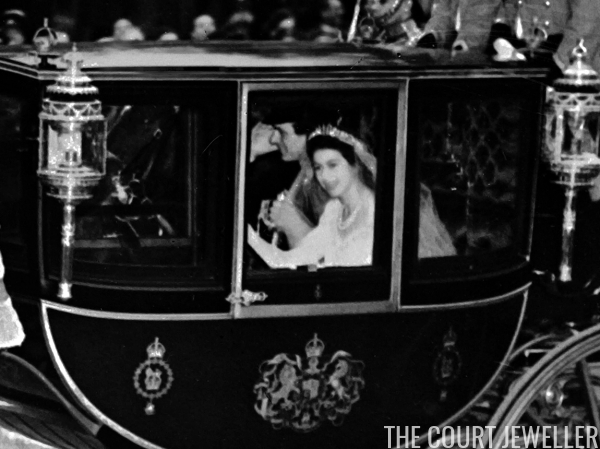 With so much attention on the early years of Queen Elizabeth II's life lately, courtesy Netflix's The Crown, the spotlight has been on one of her most important jewels: her wedding tiara. (You can read my recap of episode one of The Crown here!) Often confused with the many other fringe tiaras and necklaces in the royal collection, Queen Mary's Fringe Tiara is a piece that was created on the commission of the Queen's grandmother. This tiara is often misidentifed as the "George III Fringe Tiara" or the "Hanoverian Fringe Tiara." But don’t let the internet (and even some books) fool you — it’s not the same tiara! The so-called George III or Hanoverian Fringe was a fringe necklace that belonged to Queen Adelaide, the wife of William IV. It was worn in various ways (including as a tiara) by Queen Victoria, Queen Alexandra, Queen Mary, and Queen Elizabeth, and it is now the property of the current queen. But it’s a totally different piece. Hugh Roberts called Queen Adelaide's fringe a tiara of "less finely graduated form," noting that it is "now set as a necklace" (and presumably cannot be easily converted to be worn as a tiara). Queen Mary's fringe, on the other hand, he describes as a "new, smaller, neater and more modern-looking tiara." You can see a comparison of the two in the photo montage above; Queen Adelaide's fringe is on the left, and Queen Mary's is on the right. 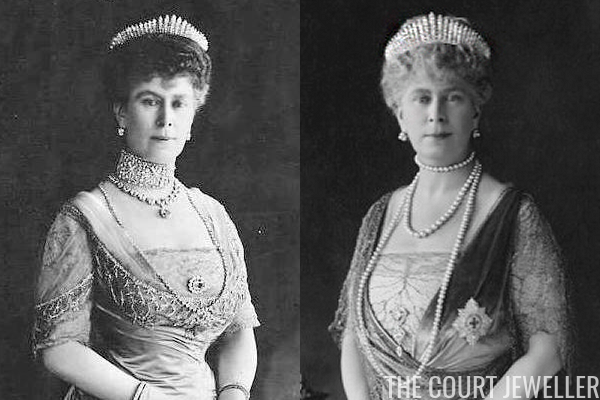 Queen Mary's fringe tiara is much newer than Queen Adelaide’s necklace. It was made of diamonds set in gold and silver by E. Wolff and Co. for Garrard in 1919. The diamonds are a bit older than that, though; they were a part of a necklace made by Collingwood that Queen Victoria gave to Mary as a wedding gift in 1893. But Queen Mary the jewelry innovator struck again, dismantling that gift and re-using the diamonds to make this fringe. 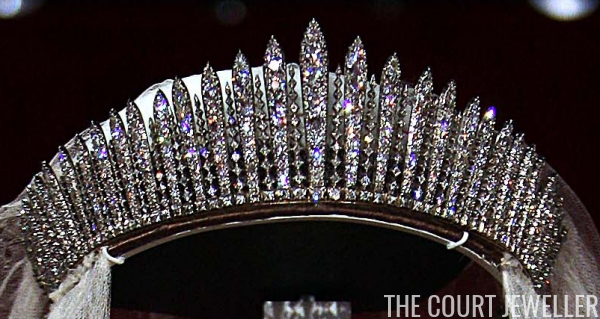 We've talked in the past about how incredibly popular these diamond fringe tiaras were after they became fashionable at the imperial court of the Romanovs, and the current Windsor collections reflect that popularity. 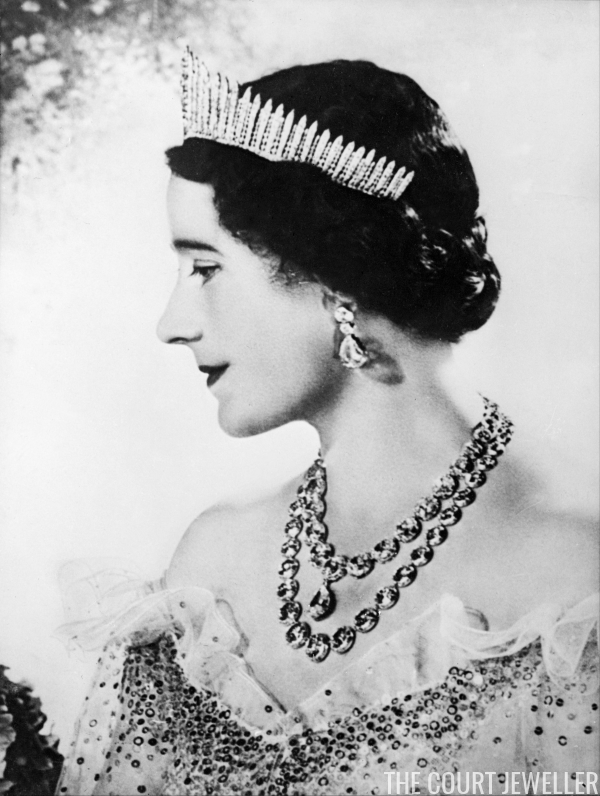 Along with this fringe tiara and Queen Adelaide's fringe necklace/tiara, the present Queen also has Queen Alexandra's fringe kokoshnik tiara, plus a diamond fringe necklace that once belonged to Princess Victoria (sister of George V) and the diamond fringe necklace (the "City of London" fringe) that she received as a wedding present in 1947. 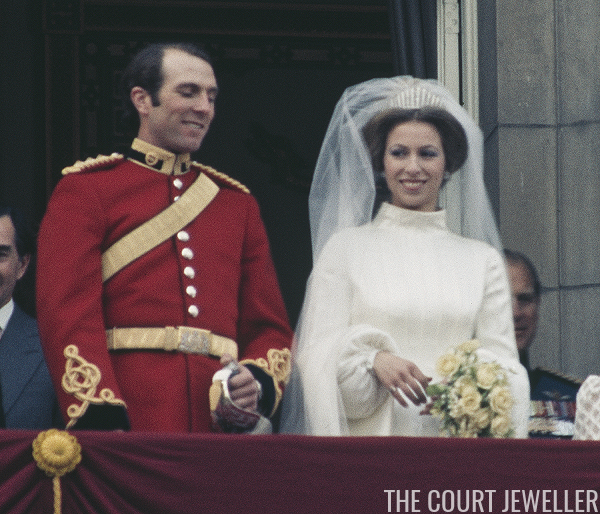 The second Windsor bride to don the tiara was Princess Anne, who wore the fringe at her wedding to Mark Phillips in 1973. Again, it was the Queen Mum who loaned the piece to her granddaughter. In the past, there's been speculation over why Elizabeth II didn't wear her wedding tiara regularly after her wedding day; the simplest answer is that it remained in her mother's jewel collection until the Queen Mother's death in 2002. Today, Elizabeth II is the owner of the piece, and in recent years, she has occasionally worn the fringe at white-tie events and in portraits -- notably, in New Zealand's Diamond Jubilee portrait, in which the tiara was misidentified as (you guessed it) the Hanoverian Fringe. D'oh!